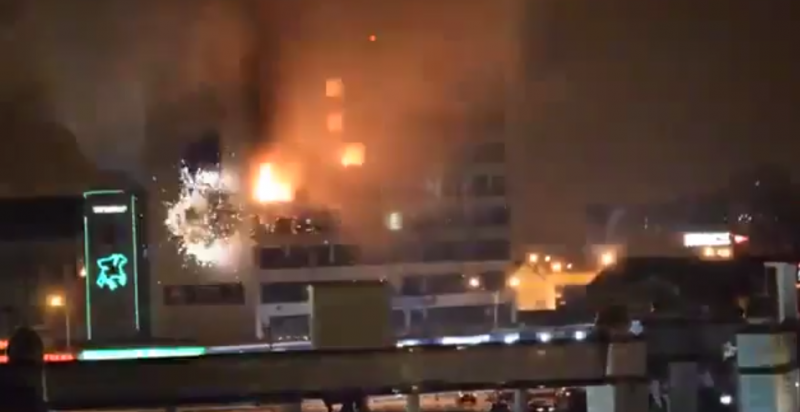 What appears to be heavy artillery hits Grozny's Dom Pechati, where an unknown number of militants are now under siege by local police and military. YouTube. December 3, 2014. The streets of Grozny, the capital of Chechnya, are currently host to an intense battle between local security forces and heavily armed militants. At least five police officers have been killed in the past few hours, an exploded police car lies smoldering in city's downtown, and Grozny's “Print House” Building is in flames and under siege. According to the Russian news service Lifenews.ru, the militants are suspected of hijacking three taxicabs southwest of Grozny and using the vehicles to infiltrate the city. They were en route to an unknown target, when traffic police stopped their convoy and discovered a massive arsenal of automatic guns, grenades, and other weapons. This was when violence reportedly broke out, leading to the deaths of several police officers. Claims that militants arrived in three taxicabs don't square with other reports about the number of armed men now battling Grozny police. Russian website TJournal.ru spoke to an eye witness who speculates that as many as 50 armed militants are currently roaming Grozny's streets. According to the witness, most people in Grozny speculate that the incursion is a failed effort to attack Grozny's airport, where Chechen leader Ramzan Kadyrov's private jet was expected to land around the time of the incident. On Twitter, Russian users allude to an audio message from the militants where they claim to have 300 men in Grozny. Bloggers also uploaded a low-resolution video featuring several men spouting Islamic rhetoric, taking credit for the events in Grozny, promising to die in the fight against Islam's enemies. Within an hour, YouTube users added Russian subtitles to the two-minute video, which ties the attackers to Aslan Byutukayev, a Chechen insurgent commander and ally of the late Dokku Umarov, the former Caucasus Emirate leader. Twitter users claiming to be either based in Grozny or acquainted with people there have posted alarming reports of violence and casualties. Armored vehicles (BTRs) in Grozny. For all the startling photos and talk of “300 Spartan” militants descending on the city, confusion seemed to reign supreme in Grozny. От жителей Грозного поступает самая разная инфа: от “У нас началась война” до “Я ничего не слышал”. They are opening a corridor to Crimea.